Lord Howe Island is a UNESCO World Heritage listed island about 600 kilometres North East of Sydney. 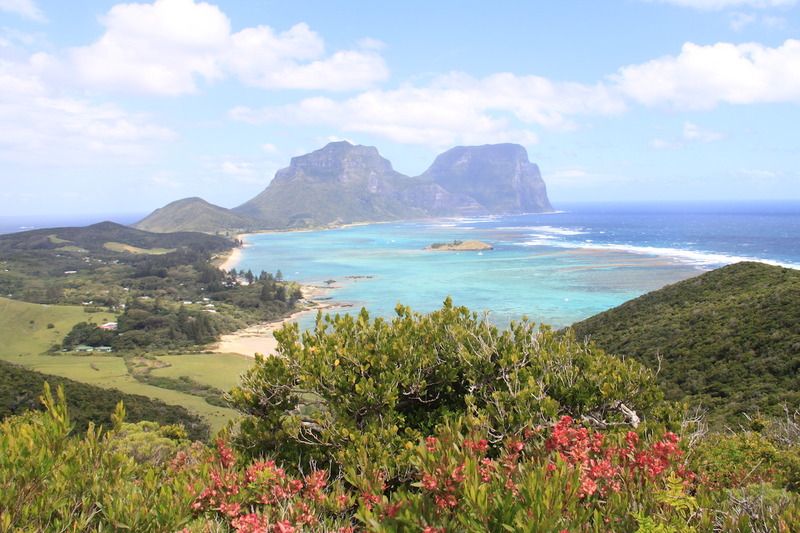 Unlike the popular islands of the Whitsundays, Lord Howe Island is not very well known to the rest of the world. Some Australians have never even heard of it. 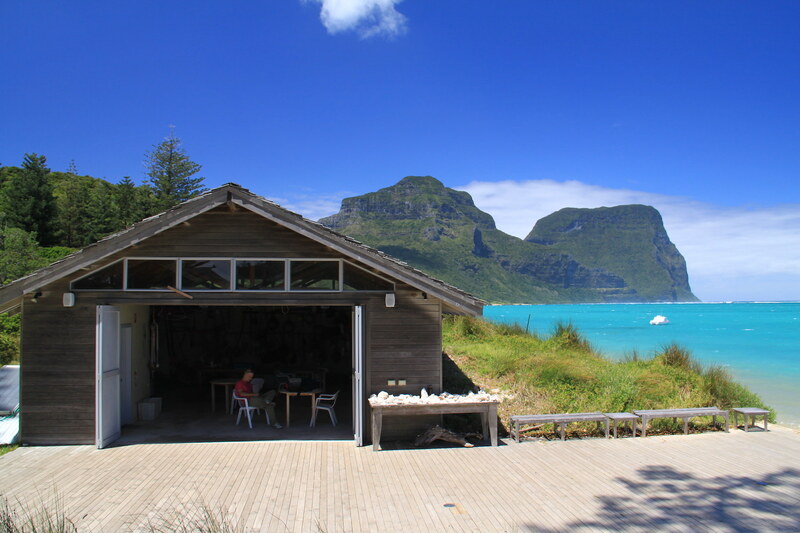 Lord Howe island is always a quiet haven. Only three hundred and fifty people live on the island. They also restrict the amount of visitors to a maximum of four hundred people at any one time. So even during the busiest season it will never feel crowded and you will always feel like you have the island all to yourself. It’s a great place to go if all you want is to relax in peace. Our flight to Lord Howe was a short two hour hop from Sydney on a QantasLink Dash-8 Turbo Prop aircraft. Qantas is currently the only airline flying to Lord Howe. 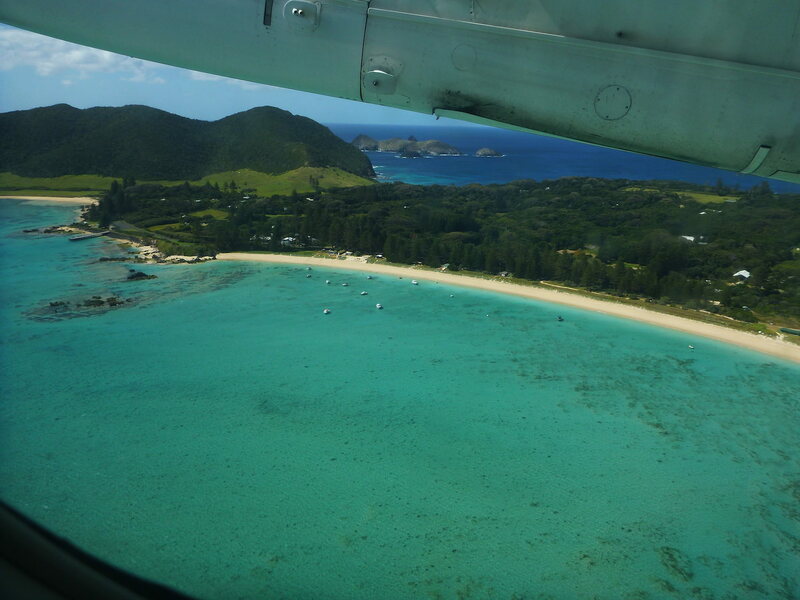 As you fly over Lord Howe the views from above are incredible with its beautiful turquoise blue lagoon and green hills. From the moment you set foot on the tarmac, you will see magnificent views of the imposing Mt Gower and Mt Lidgbird. From that point, I knew I was already in love with this island. We chose to stay at Pinetrees Lodge which is the oldest accomodation on the island.There are many options on the island, from backpackers dorms to one of the most expensive hotels in Australia, Capella Lodge. Pinetrees was excellent, affordable with friendly staff and clean rooms. The price included all the delicious food we had during our stay. Lunch was the best part! Their buffet lunch was the best we’ve had anywhere. And if you don’t want to go back to the hotel for your lunch, Pinetrees can organise a take away picnic. Or they can even drop off a BBQ lunch at your chosen beach so you can have your own private BBQ on the beach! Both of us are very keen snorkelers so we were really looking forward to our first day exploring the lagoon’s sea life. 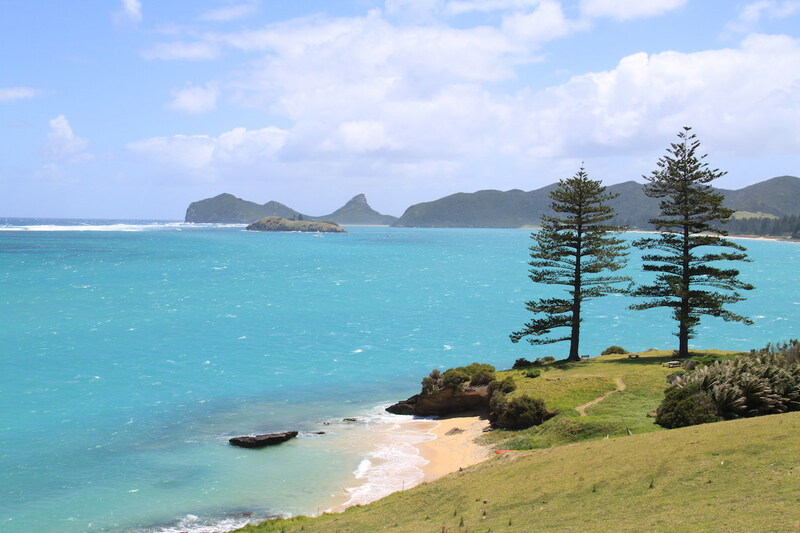 Unfortunately, there is one tiny problem about Lord Howe Island, it can get really, really windy. And that terrible wind can last for a few days… In our case it lasted the whole four days we were there! We found out on our first day that our two hour circle the island boat tour had been cancelled. We enquired about other snorkelling tours which were also all cancelled apart from the North Bay Turtle and Nature Tour with Marine Adventures which included forty five minutes snorkelling. So off we went! I am so glad we managed to get onto this tour as not only were all the other snorkelling and boat tours cancelled for the rest of our stay but this trip just happened to be perfect! Firstly, we all jumped onto a glass bottoms boat to do some turtle spotting. We saw a hundred year old turtle called The General. It was amazing to see how big they can grow. The General was huge!. Next stop was our snorkelling spot. The water was freezing even with the wetsuit they provided but it was well worth the chill as the marine life was incredible; lots of colourful fish and coral. 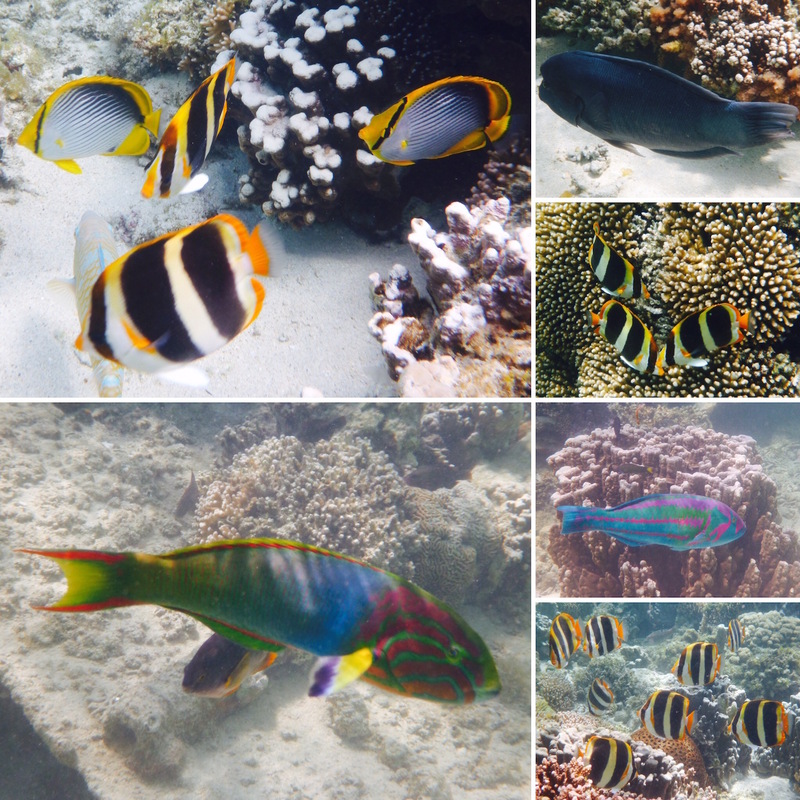 Lord Howe has lots of varieties of fish and coral, nearly five hundred types of fish and ninety species of coral. I could have stayed in there for hours! Time flies by way too quickly when you are having fun and we had to get back onboard the boat to make our way to North Bay. At North Bay we paused for a cup of hot chocolate to warm us up. 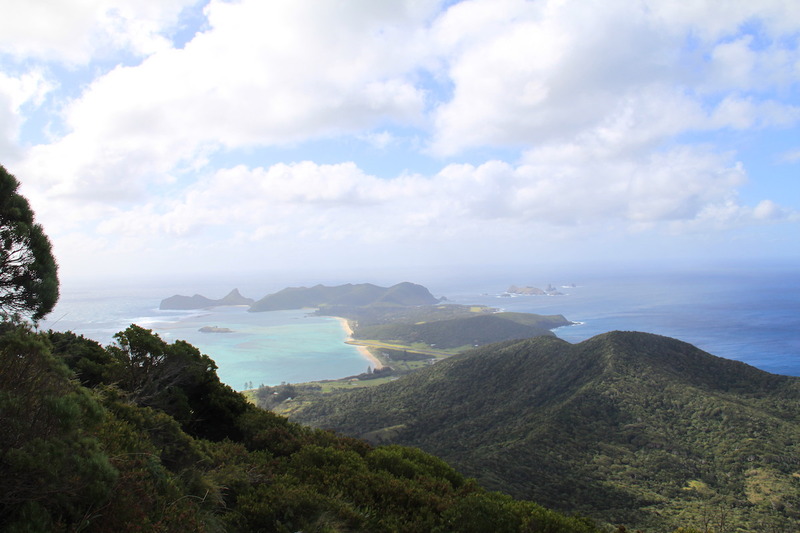 We then climbed Mt Eliza for a beautiful view of the North side of the island. At the end of the tour, our guide gave us a guided tour along the beach. 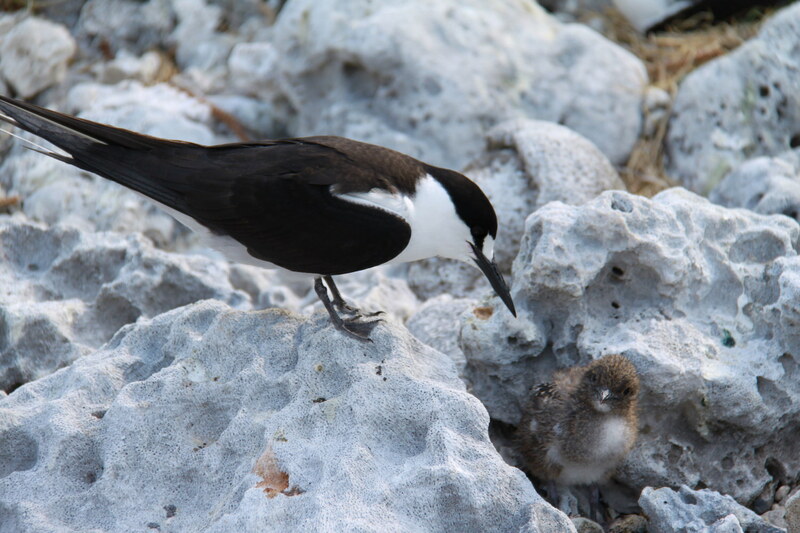 He showed us the island’s migratory seabirds, who were nesting at the time. 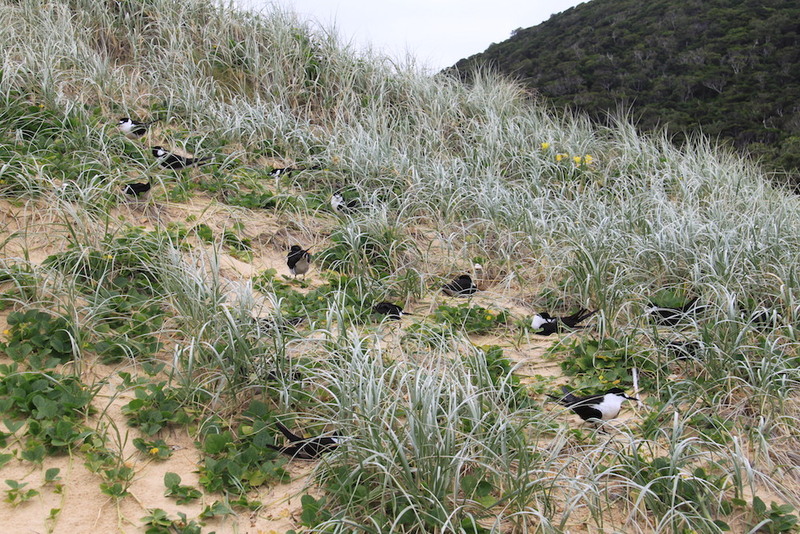 Yes Lord Howe doesn’t have kangaroos, koalas or wombats but the bird life is abundant. It is a bird watcher’s heaven, with over hundred and fifty species of sea and land birds living on the island or visiting the island each year. On our second day we hired bikes to explore the island, which is the best way to do it. There are cars on the island and you can rent them but the island is so small that it’s barely worth it. 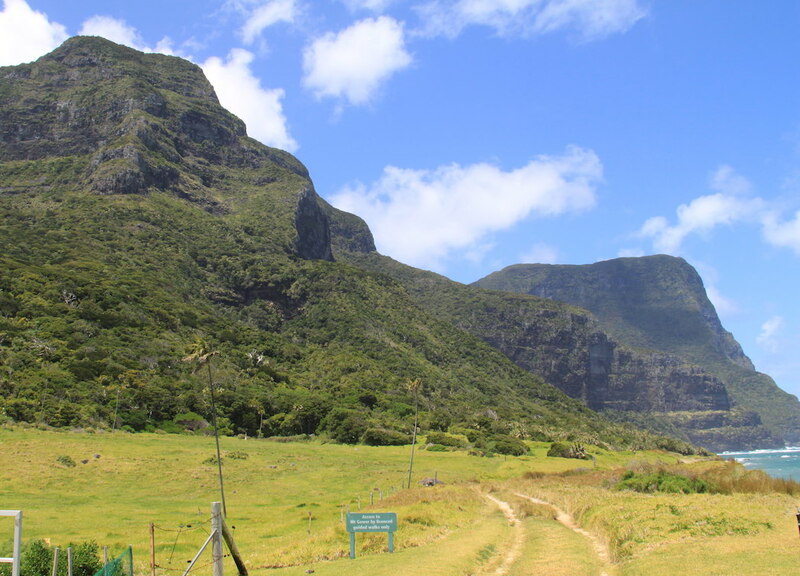 You can even walk around; Lord Howe is after all only 11 kilometres long and 2 kilometres wide. Riding around this small island doesn’t take that long. But you will find yourself stopping so many times to enjoy the scenery that it might take you all day! Visiting Ned’s beach is a definite must do activity on the island. It is popular due to the huge fish that swim in the shallow waters near the beach. They are patiently waiting for tourists to come and feed them. You can buy some fish food from a dispenser right there on the beach and for only a dollar you will get a great experience! 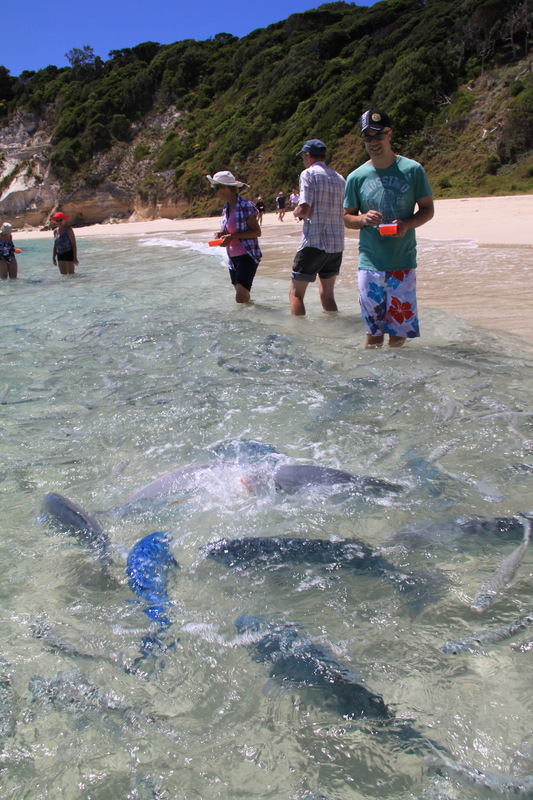 You can also snorkel off the beach and swim with those big mullets, wrasses, garfish, silver drummers, spangled emperors and metre-long kingfish! Snorkels and fins are available on the beach by making a donation in the honesty box. Since we couldn’t go on any of the boat tours, we decided to do some of the hiking trails on the island instead. There are many of them and they vary from easy to quite difficult. The most famous one which is also the hardest is the hike to Mt Gower. You need to be a fit and experienced hiker to attempt this one and you must be accompanied by a guide. I wish I could say we did it but as we were hoping we would be spending all our time in the water we didn’t think about taking our hiking boots! You would definitely need hiking boots for this hike! So we missed out on this one but it is on the bucket list for next time. I have not doubt that the view from the top would be well worth the eight hours walk! So instead we started with the Malabar Hill and Kim’s lookout hike which is five kilometres return. From the top you get the best views of the south end of the island. If you are reasonably fit it isn’t a difficult hike although it does get steep at times. If you do one hike on the island, this should be the one. If you prefer a shorter and easier hike, Transit Hill takes just two hours. It starts at the middle of the island, going through forested areas and countryside. Once you reach the top you get a 360 degree view of the island. 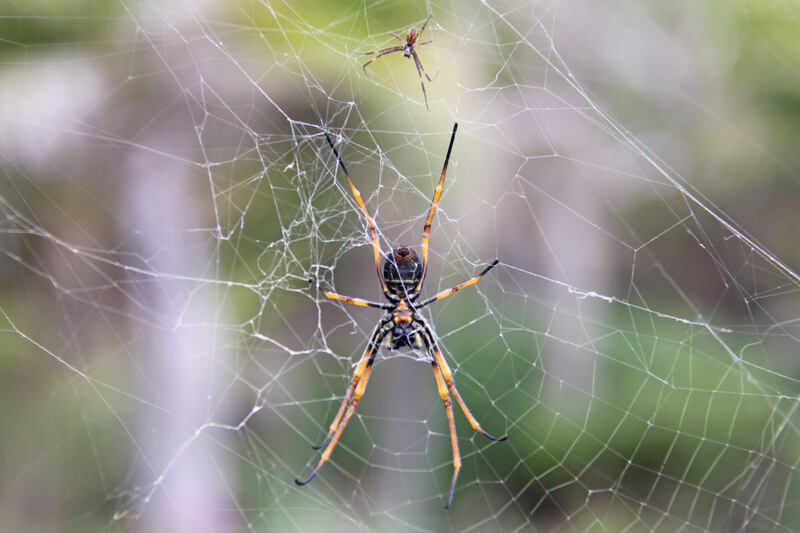 You just need to be careful when walking on some of the paths as the island’s resident spiders love to spread their webs around! If you don’t look where you are going you may come face to face with one of them or even worse walk straight into the web and end up with a spider on you. Having arachnophobia myself, this is not my idea of fun! Beware the spiders on the Transit Hill walk! On your way down from Transit Hill, you should follow the path down to Blinky Beach. On Blinky Beach you can have a swim or just enjoy a walk on this stunning deserted beach. During nesting season you will also see many birds around that area. Another great walk for experienced hikers which we ended up doing was the trek to the Goat House Cave. This one was tough, very steep and rocky and it is rope assisted in lots of places. But once again the views from the top were amazing and totally worth the effort. Even though it was disappointing that we were unable to spend more time exploring the lagoon. 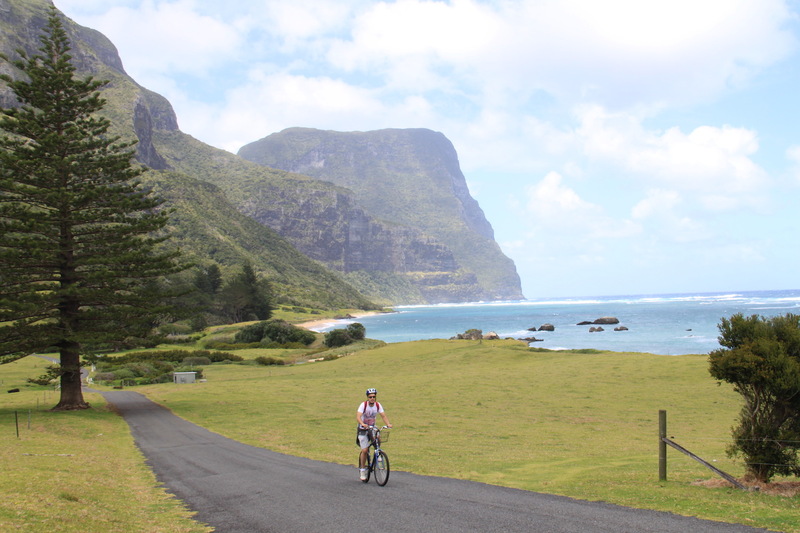 We still enjoyed our trip to Lord Howe Island. It’s such an amazing place and there is so much to do considering how small the island is. We are looking forward to our next trip so we can hopefully get to snorkel the lagoon more. We may even attempt to conquer Mt Gower!